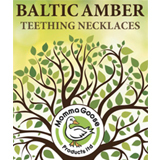 A genuine Baltic Amber teething necklace is a natural form of pain relief for teething babies. Amber itself is a fossilized tree resin and contains �succinic acid� which, by body warmth, is released into the skin when worn. Succinic acid provides anti-inflammatory and analgesic properties. For teething baby, this means pain relief and reduction of the inflammation of the gums that accompanies teething.